Dark and cold January days need a little sunshine, don’t you think? 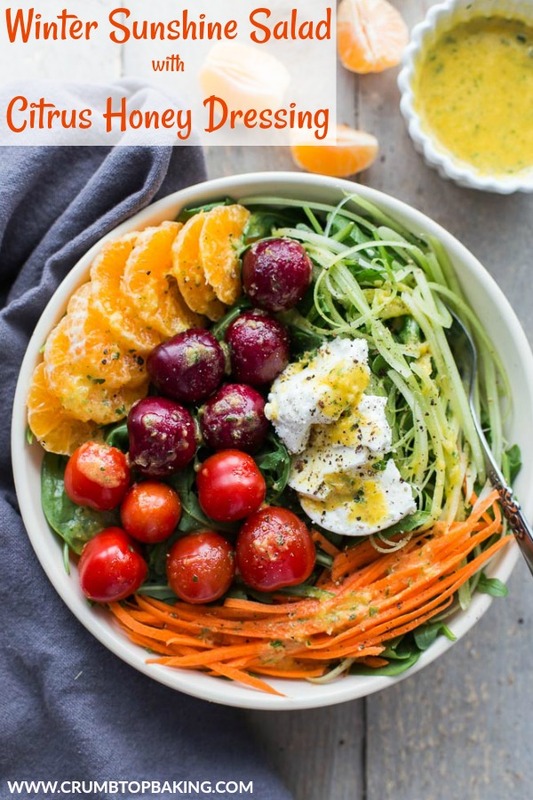 So let’s make this Winter Sunshine Salad with Citrus Honey Dressing and pretend it’s spring! It’s the second week of January, and it seems like it’s cold, dark and dreary all the time. I mean, I love the occasional cold evening where I can curl up by the fire in a cozy blanket and sip on a hot cup of tea. But waking up in the dark and leaving work in the dark is definitely beginning to wear on me. And since this is really just the beginning of winter and spring is still over two months away (eek! ), I had to do something to add a little sunshine to my life! 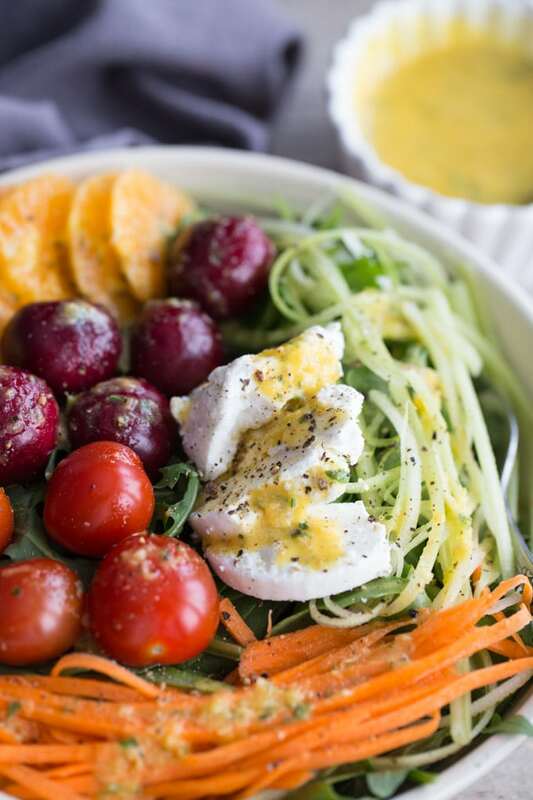 This Winter Sunshine Salad with Citrus Honey Dressing is bright and colourful, and essentially, sunshine in a bowl! I first whipped up this salad on New Year’s Day using the fruits and veggies I had left in my fridge from the holidays – spinach, arugula, kale, carrot, celery, tomatoes, clementines, cherries and goat cheese. I was seriously surprised I had so much ‘good’ stuff left in my fridge! And it made me realize how much my fruit and veggie consumption tanked over the holidays. This salad might seem like a random assortment of fruits and veggies (because it kinda is), but this combo actually works really well together. And the other reason I’m not too fussed about the ingredients is that the real star of this salad is actually the Citrus Honey Dressing! 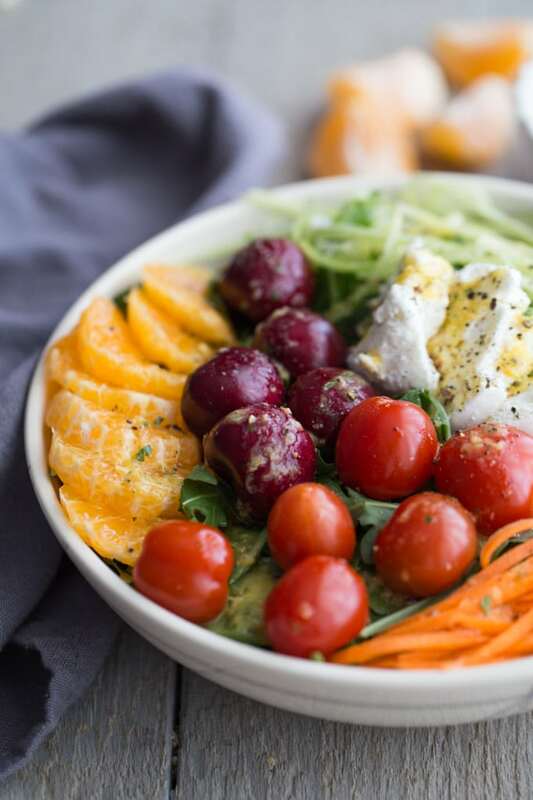 This dressing has just five ingredients – clementines, honey, oil, red wine vinegar and parsley, and is seriously easy to make. And it’s clean eating. So it’s pretty much the perfect topping for all the greens you’re eating this January! While I haven’t tried it yet, I’m betting this dressing would be great on top of this zucchini noodle bowl or this spicy salmon pasta salad. And speaking of clean eating, greens and January, my challenge to add green fruit and/or veggies to every meal in January continues! I’m actually having a lot of fun with it and finding creative ways to add greens to different recipes. My new favourite breakfast, for instance, involves a combo of overnight oats and a green smoothie….together in one bowl. Be sure to look out for that recipe on the blog soon. In the meantime, keep eating those greens! I’d love to know what you’re doing this month to creatively add more fruits and vegetables to your meals. Let me know in the comments below or feel free to reach out on Instagram. 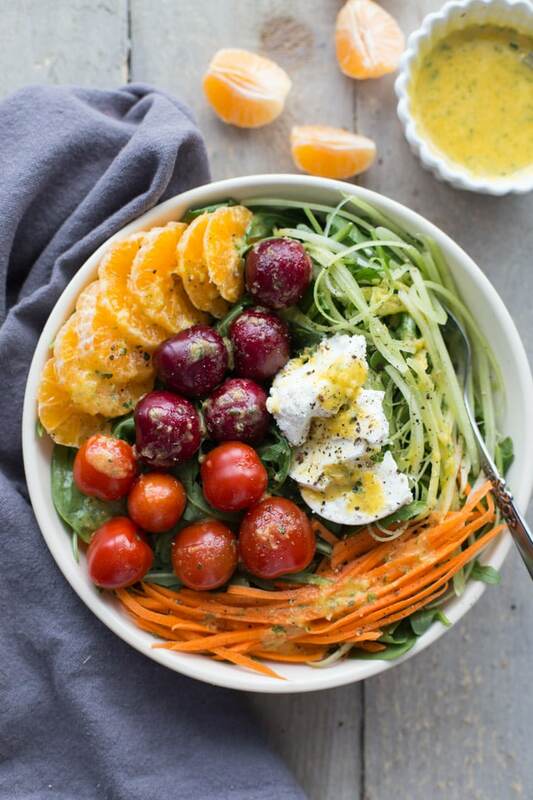 Winter Sunshine Salad is a mix of greens, veggies and fruit tossed with a simple Citrus Honey Dressing made with clementines, honey, extra virgin olive oil, red wine vinegar and parsley. It’s essentially all your favourite fruits and veggies covered in sunshine! To make the dressing: Add all the ingredients to a blender, except the parsley, and blend on high until liquefied and well blended. Add in the parsley and blend for a few seconds. Pour into a dish or mason jar for storing and serving. 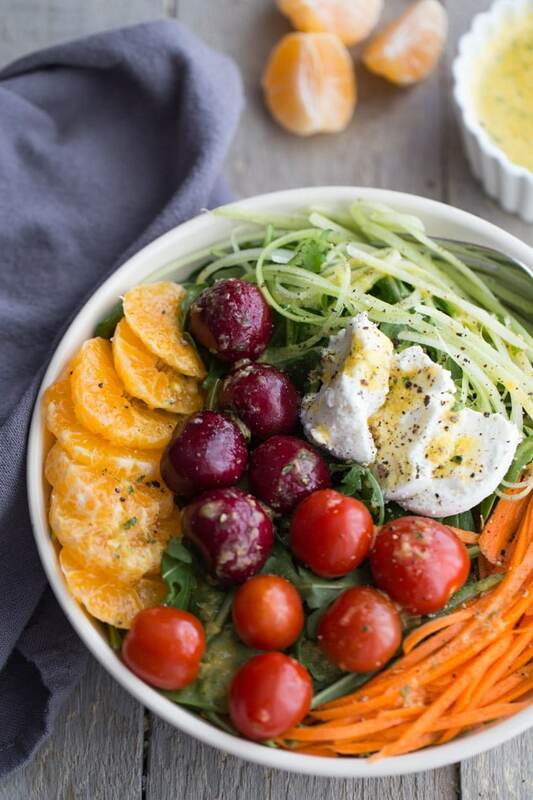 To assemble the salad: Divide all the ingredients into two bowls, drizzle with dressing and sprinkle on a dash of pepper. The dressing makes about 1 cup, so you will likely have some leftover. Just store any leftovers in an airtight container or mason jar in the fridge and consume within 2-3 days. If you want to add some protein to this salad, you could add chicken, turkey or salmon, or even nuts, seeds, quinoa and chickpeas. Winter is so hard!! I feel like January is definitely the worst – it’s so dreary and all of the excitement of Christmas is over. We need more bright and sunny dishes like this to get us over the hump!! I can’t wait to try out that dressing. Pinned! Thanks Heather! I love adding fruit to my salads for the very same reason! Currently obsessed with clementines, so they’re ending up in all my salads! Thank you so much Ashika! I hope you enjoy it. I had it for lunch again today, and I’ll probably have it again tomorrow! Let me know what you think if you make it! I’m so into citrus fruits right now Leanne! This salad looks spectacular. Loaded with everything healthy for the new year! LOVe that dressing! Thanks Mary Ann! I’m with you on the citrus fruits! Totally addicting! Have a great week! Thanks Kim! I hope you get a chance to give it a try! Let me know if you do! Thanks Dawn! It felt like spring this weekend, so I’m holding out hope for an early spring! In the meantime, I’ll just keep making this salad! Have a great week! Those short winter days can really be depressing. I’m craving everything sunny right now and this sounds perfect! Have a great week, Leanne! PS, I can’t wait to see the overnight oats-green smoothie recipe. It sounds right up my alley! Thanks Kelsie! I totally agree about the short winter days. I miss late evening sunsets! As for the overnight oats green smoothie, it’s now up on the blog. Hope you like it! This is such a bright and cheerful salad for these winter days! 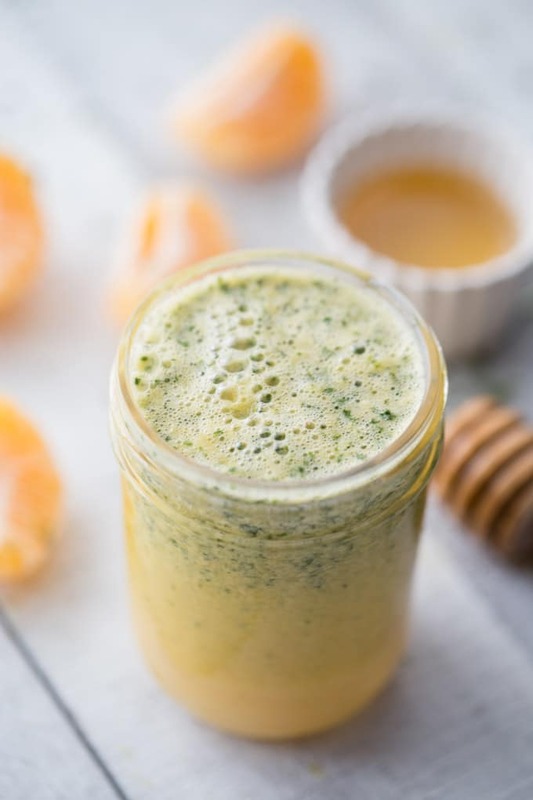 I love the sound of this clementine dressing! It’s always refreshing to try new flavors together! Thanks Deepika! The clementine dressing is tasty, and really easy to make. 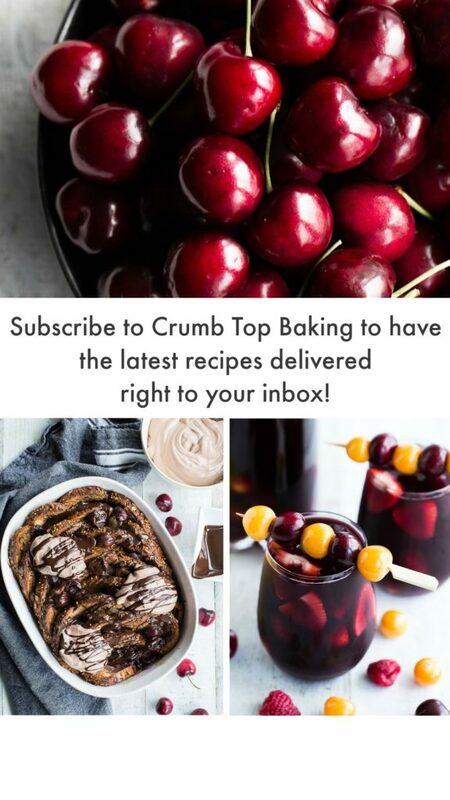 I’ve been whipping up a batch every few days! Enjoy the rest of your week! Such a perfect combination of some exceptionally healthy ingredients, Leanne! Can I use some other kind of cheese for this salad? Thanks Nathalie! I might be eating this salad for a few weeks yet if I’m waiting for spring weather to arrive! Hi leanne, I just love the colors and presentation of your salad. The fact that you did a fridge clean up and came up with such a beautiful dish is a bonus. I liked that you julienned some of the veggies, there is something playful about veggies done this way and I love that crunch you get from them. Your dish had me day dreaming of spring, the smell, the birds chirping and the swaying of the tree branches with the formation of the new buds. Thanks Loreto! Now your comment has me daydreaming of spring! :) I love to add julienned veggies to my salads for the very reason you described. Of course, it takes a bit more time, so I don’t get to do it as often as I would like. I’m glad this salad conjured up some happy images for you! Have a great week! 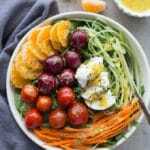 What a gorgeous, flavorful salad! I’m hoping by making a sunshine salad, that the sun will take the hint and show itself. 😉 Hope you have a great weekend, Leanne. I’m just gonna drool over this salad for a little while longer. Thanks Nicole! Yes, I’m hoping if I keep making this salad the warmth and sunshine will show up! I’ll keep you posted on that! 😉 I hope you had an awesome weekend! Great idea for a salad! I love using up leftover on my salads and usually always have olives, tomato, and cucumbers around. Then I just add some nuts or seeds and whip together a quick vinaigrette. No planning required! Thanks Markus! I can never let fresh fruits and veggies go to waste, so I always end up making a salad with random ingredients! The salad you describe sounds delicious. Love adding seeds and nuts, and a homemade vinaigrette is a must! This looks delicious. I love a big salad once in a while in the winter to lift my spirits. I’ve made dressings with fresh orange juice and lemon juice, but never tried with clementines! What a great idea! and I love the addition of parsley, such an important and healthy herb that we need to use more often. Love it! Thanks so much Gabby! I love the parsley in this dressing. It pairs well with the citrus. I’ll probably be eating this salad year round! Have a great week!